Hanging drywall is a relatively straightforward project, even for do it yourselfers. But the final task of finishing drywall can easily frustrate even very skilled DIYers. Hanging drywall is simple. But most significantly, since it is not the last step in the process, flaws can be later covered up. Finishing, by contrast, is the very last stage, and this means that you have no more methods of fixing flaws at your disposal. This is it; you need to get it right. 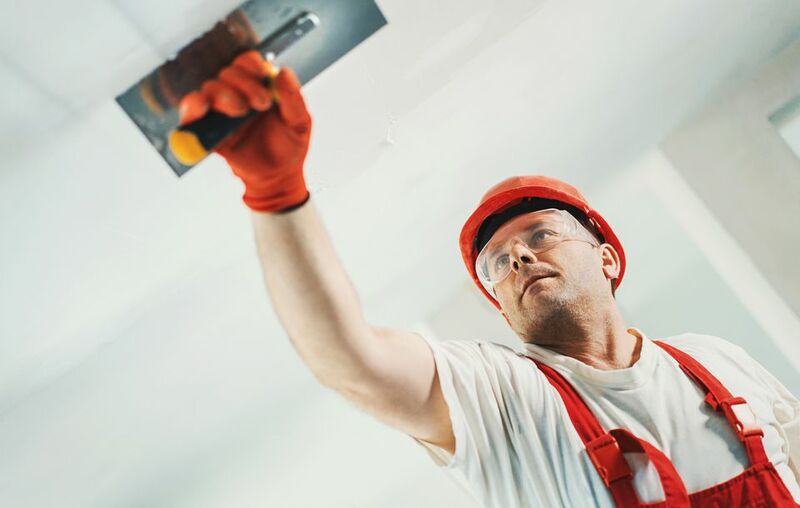 Drywall finishing requires a good deal of craftsmanship, which is why the gypsum industry and drywall professionals have codified a set of professional standards that breaks the process of finishing drywall into five distinct levels. Serious DIYers should take note of finishing levels if they want their finish to look as professional as possible. Rather than seeing finishing as one process, the pros break their work into discrete stages. Level 0: Level 0 implies that no finishing of any type has been done. The drywall is only fastened to the walls or ceiling. Level 1: This level means that your drywall joint tape has been embedded in joint compound, and nothing more. Level 2: This next level means that you have skimmed a thin coat of joint compound over the tape and covered the drywall screw holes. You can stop at this level if you intend to cover with tile. Level 3: For this stage, you apply a coat of joint compound to the tape and screws. Walls that will receive a heavy texture, such as knockdown texture, can end at this level. It would be pointless to progress beyond this level, since texturing is rougher than level 3. Level 4: This is the classic drywall finish. Here, you apply another coat of joint compound to the tape and screws and sand the dried compound. Level 5: The highest possible level of drywall finishing involves applying a skim coat, if applicable. Use a Roller: Thin out the mud and roll onto the wall with a thick-nap roller. Scrape off immediately. With a Taping Knife: Apply a series of six or eight dabs of mud, each about three to four inches in diameter. Immediately smooth the mixture across the surface, then scrape the mud off. Spraying It: Professionals have spray equipment to allow them to spray on drywall compound. This type of equipment can be rented at rental yards or even at some home improvement stores. Garages: For instance, level 1 drywall finish is frequently used in garages and workshops. Why mud and sand a space that is rarely ever seen? On the other hand, a car aficionado or an obsessive tinkerer might enjoy having a workspace that is as clean and smooth as any other wall found in the residential part of the home. Wainscot-Hidden Finishes: Putting in wainscot? Then you don't have to put a premium finish on the lower 45 inches of your walls. It will get covered up anyway. Cabinet-Hidden Areas: Because kitchens are often blanketed with cabinets and appliances, much of the wall space doesn't need a level 5 finish. Conversely, ceilings tend to get raked by natural light through the windows, highlighting pops, bumps, and depressions. For many homeowners, nothing less than a level 5 will do on their ceilings. Do You Ever Need a Level 5 Drywall Finish? A level 5 finish is a skim coat of joint compound (also known as mud) applied to a finish that you would normally leave at level 4. The two instances when you need a level 5 coating: the finish will be glossy and/or light will be coming from an angle low enough to highlight bumps and depressions. The level 5 is like icing on the cake. It's a premium finish that you will not get by default; you absolutely will need to discuss this with your contractor or drywall installer, as it is not normally considered part of the finishing process. Should you discuss drywall finishing levels, in those terms, with your contractor or tradesman? Excluding level 5, it is generally not needed, and might even insult a tradesman who already knows his or her craft. But as a DIYer, you may find the concept of finishing levels valuable because it aids you in remembering that not every room needs a level 4 finish (and certainly not a Level 5 finish). It also slows you down and helps me keep each process separate.